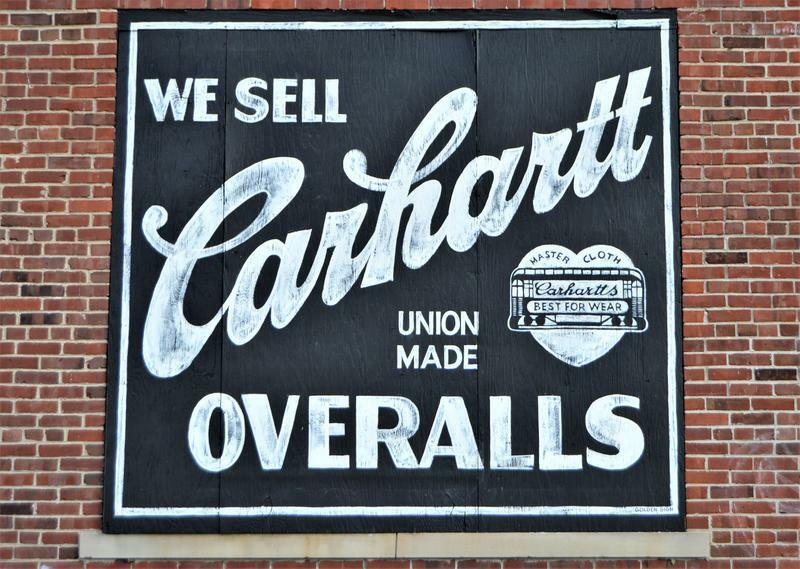 Jordan Zielke was one of the sign painters who worked on this Carhartt mural. Zielke is painting a window at The Apparatus Room in the old Detroit Fire Department headquarters. An example of a gold leaf window job by Zielke. Different karats of gold are the reason for the different colors. Zielke also paints signs that appear to be weathered, giving them a vintage look. Jordan Zielke of Motown Sign Company. 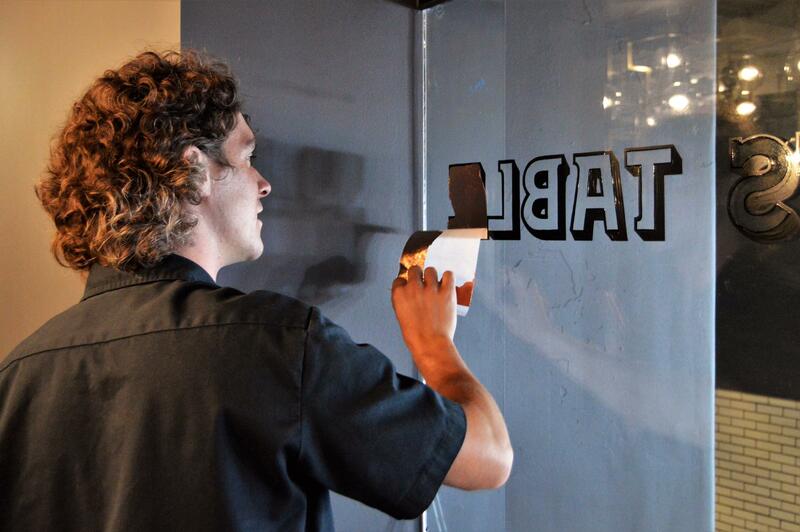 Listen to Jordan Zielke talk about sign painting. “It’s meant to convey and idea or an image. And, with lettering and signs there’s a right way and there’s a wrong way to do it. I felt with art in some regards there is no wrong way,” he explained. Zielke also likes the variety of the work. Some of it’s mundane. Some of it is spectacular. 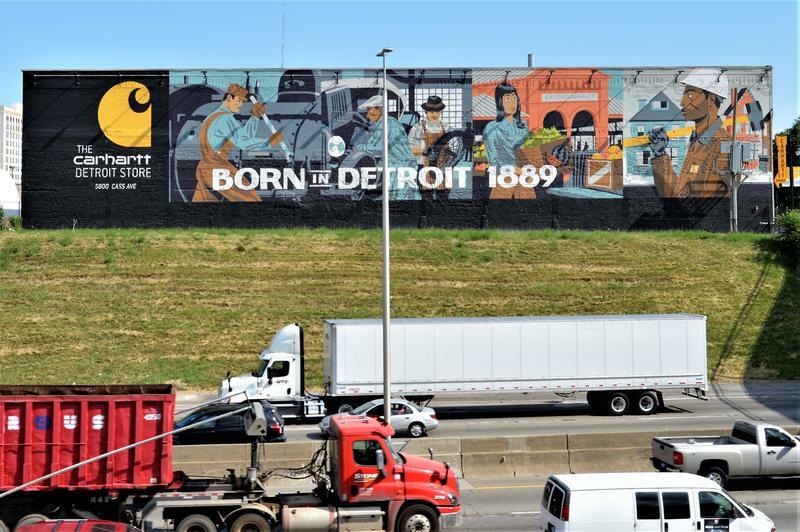 Zielke worked on this mural in Detroit. The design is by Detroit artist Charles McGee. “One day you’re lying on your back lettering ‘NO PARKING’ on a roll-up garage door. 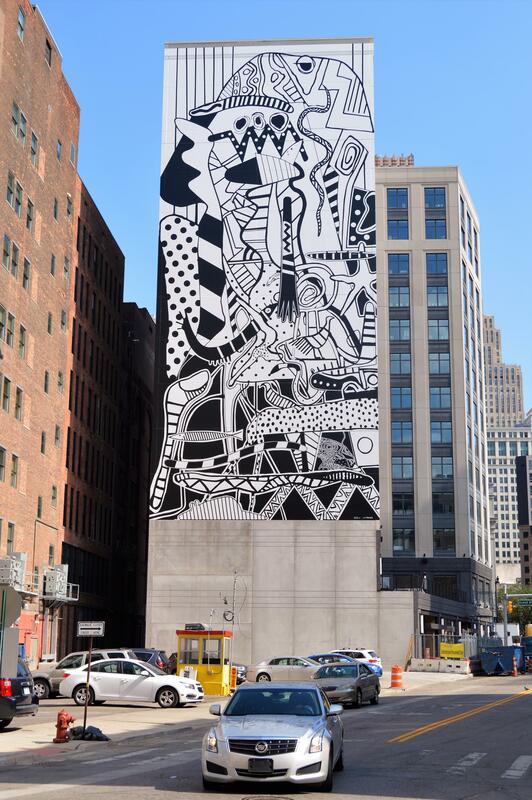 Another day you’re 14 stories in the air painting a mural that’s 200 feet tall,” he said. Zielke says favorite jobs are wall signs. There’s a big one that a lot of people drive past each day. “We did a job for Carhartt. 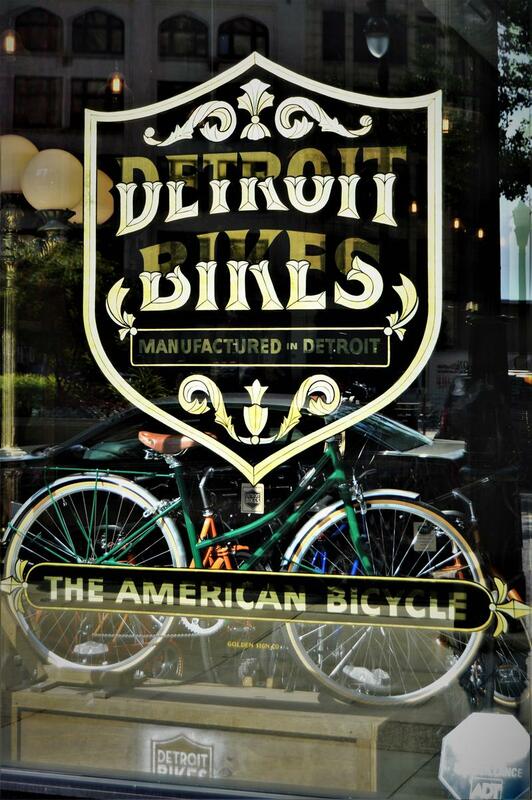 They opened a flagship store in Midtown Detroit that faces I-94,” he said. He also made the point that he just painted it. The design work came from a couple of “awesome guys” at the College for Creative Studies. 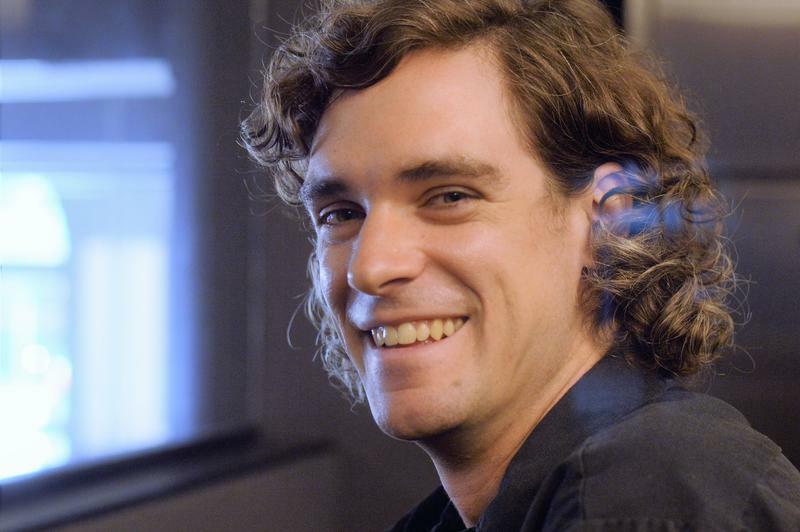 When I talked to him, he was at the Foundation Hotel's restaurant The Apparatus Room in the old Detroit Fire Department headquarters. 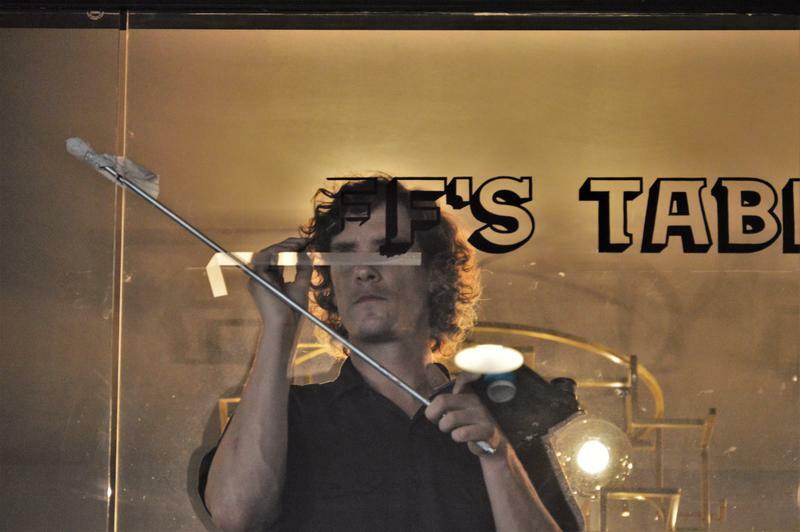 He was painting a window and preparing it for copper leaf. It’s like the more common gold leaf. Basically he applies thin leaves of gold (or in this case copper) to a clear adhesive that he’s painted in the shape of a letter. Zielke is applying copper leaf to an adhesive he's painted within the black outline on the window. He'll remove the excess. See what it looks like from the other side in the slide show above. 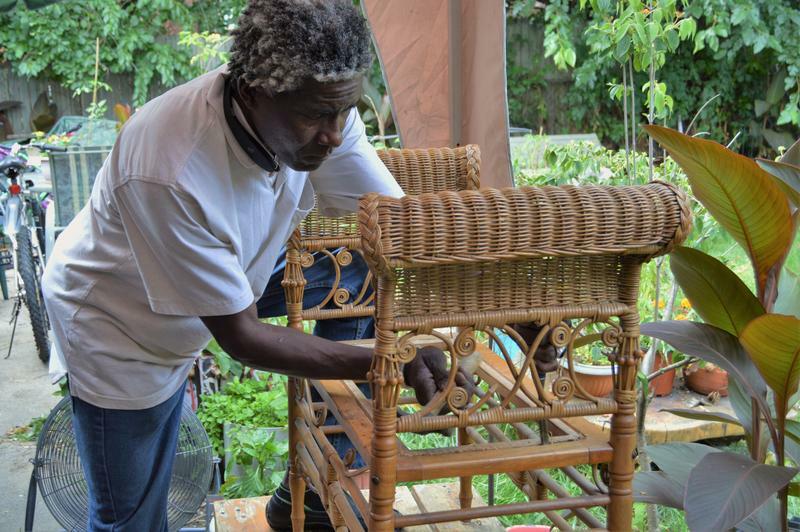 He says other people stop and talk about a grandparent who painted signs or an uncle who had a shop. Zielke says there are not nearly as many sign painters as there once was, but the trade is experiencing something of a renaissance. Especially in Detroit where new businesses and those who are improving want a custom look to their signage. “It’s a really great to be involved with Detroit and to be not just a spectator, but a player in it,” he said. One job he’d really like to get, but hasn’t yet, is a Vernor’s wall sign. He’s just waiting for the call. “That would be a blast,” he said.